NOVA looks at the ‘next big things’ that will be affecting the way that we live, work, and breathe. I Lost My Job looks at how technology makes some jobs obsolete (travel agents, operators) and creates new jobs. Are you someone who has benefited or seen their job taken from them and placed in cold, metallic hands? Everything is a Remix: in four parts. Digital technology has made everything into a remix: our photographs, our videos, our songs, our memories are a constant re-imagining, re-positioning, and re-filtering. It is almost time for humanity to start building humans. The stuff of science fiction has become more of an ethical debate than a theoretical one. Internet Rising looks at the relationship that exists between the world wide web and human collective consciousness. Documentaries like this one provokes interspersion about the very device you are on right now. Paradise or Oblivion is a brand new documentary by The Venus Project. This documentary has been getting a lot of buzz. Around the world in 80 days? How about around the world in 7 minutes! This short video footage is space eye candy. Meet Spirit and Opportunity. They look like WALL-E. They are exploring Mars – something that people in 1969 thought we would have done by now in person. Life in a Day, in our opinion, is one of the most charming documentaries ever made. The entire documentary takes place over the span of one day on Earth. Inside Japan’s Nuclear Meltdown is a brand new documentary by PBS that looks at Japan’s Nuclear fallout following the March, 2011 9.0 Earthquake that rocked the coastline and provoked a devastating Tsunami. The strike that killed Osama bin Laden provided a glimpse of the vast and often secret campaign by US special forces and troops to kill thousands of Taliban and Al Qaeda fighters. Machines The team showcase breakthroughs in technology and engineering that are creating a new generation of machines. Mark Evans fuses his brain with a computer in Switzerland to test a new breed of machine. 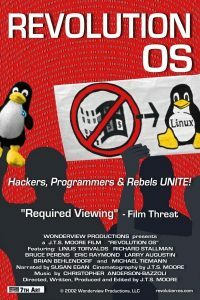 Revolution OS tells the inside story of the hackers who rebelled against the proprietary software model and Microsoft to create GNU/Linux and the Open Source movement. An idea born in unsettled times becomes a feat of engineering excellence. The most complex machine ever built to bring humans to and from space and eventually construct the next stop on the road to space exploration. Imagery rarely seen by the public which highlights space shuttle launches from 1981-2010. Set to certain relaxing music, this special video was produced by NASA engineers at the Glenn Research Center. Imagine if hundreds of years from now, scientists excavated the abandoned ruins of some of our largest cities, what conclusions would they come to? Episode 1: Is There Anybody Out There? This documentary series sets out to examine the evidence (physical or otherwise) for the existence of UFO’s. Zeitgeist: Moving Forward, by director Peter Joseph, is a feature length documentary work which presents a case for a needed transition out of the current socioeconomic monetary paradigm which governs the entire world society. Ten years in the making and culled from 5000 hours of footage, We Live in Public reveals the effect the web is having on our society, as seen through the eyes of “the greatest Internet pioneer you’ve never heard of”, artist, futurist and visionary Josh Harris. Where and what is nano? How will it shape our future? Nanoscience is the study of phenomena and manipulation of materials at the nanoscale, where properties differ significantly from those at a larger scale. This fascinating short documentary explores the real-life theories behind the science of time travel. Traveling through time is a concept that is so highly intriguing that there a subculture of people that are obsessed with the very possibility. The origin of video games lies in early cathode ray tube-based missile defense systems in the late 1940s. These programs were later adapted into other simple games during the 1950s. In the mid 70s, Steve Thaler began toying with rudimentary artificial neural networks. Soon after, he began to experiment with colonies of neural networks that launched into brainstorming sessions with one another to produce the equivalent of stream of consciousness and contemplation.